This photograph (left) illustrates some of the shortcomings of a traditional streetlight: light pollution, glare, wasted energy, and an uneven illumination of the ground. The perfect design for a streetlight (far right) would eliminate these problems. Credit: Optics Express. 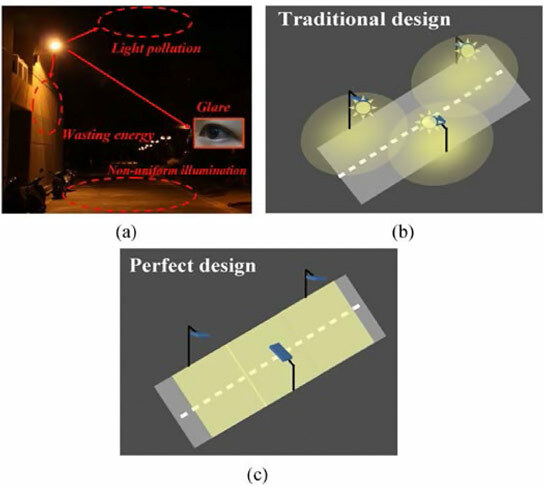 In a new study, a team of researchers report the development of a new street lighting design that harnesses high-efficiency LEDs and ensures they shine only where they’re needed, cutting light pollution and glare and saving energy. Washington — Streetlights illuminate the night, shining upon roadways and sidewalks across the world, but these ubiquitous elements of the urban environment are notoriously inefficient and major contributors to light pollution that washes out the night sky. Recent innovations in light emitting diodes (LEDs) have improved the energy efficiency of streetlights, but, until now, their glow still wastefully radiated beyond the intended area. A team of researchers from Taiwan and Mexico has developed a new lighting system design that harnesses high-efficiency LEDs and ensures they shine only where they’re needed, sparing surrounding homes and the evening sky from unwanted illumination. 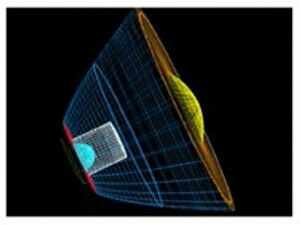 The team reported their findings today in the Optical Society’s (OSA) open-access journal Optics Express. 3 Comments on "LED Streetlight Design Reduces Light Pollution, Saves Energy"
We need more of this technology,now!! HOW, when, FAST!! I’m really impressed with this idea. Great idea. LED light is more preferable to use, not only we can conserve electricity but at the same time it can give a better lighting compared to the bulb light. Technology is fast developing and there are many things we need to consider in order to make our lives more convenient and easier.